The essence of thirumanthiram is “Om” that is also known as “praNavam”. The crux of praNavam is being described in this first pAsuram. rupARkku = stand by such great aforementioned advices from their AchAryAs. iruppan = will strongly believe in this. The letter / name “a” (अ or அ) denotes only Sriman nArAyaNan. The root / origin (daathu) for it is (अ or அ) = “ava rakshanae”, that means “One who protects”. There is a separate section in Vedas that talk in more detail as to why “a” (अ or அ) represent Sriman nArAyaNan only and no one else and also why only HE can be the lone protector and no one else can. It talks about “sAmAnAdhikaranam” logic which we will not go through here. But let us try to understand it in much easier and simpler terms. Sriman nArAyaNan is the cause of all causes (primordial cause). This has been proved by azhwar’s pasurams, Vedas, Upanishads and what not. He is the source of all objects, both finite and infinite, conscious and non-conscious. There is nothing in the universe that was not born without HIM or without HIS connection. Similarly, in the phonetic scheme of things, the letter “a” (अ or அ) is present in all other letters in one form or the other (explicit or implicit). For example, in Thamizh if we look at the word “ப”, it is a break of “ப் “+ “அ”. If we consider “கி”, we can break it up into “க + இ”. Now if we further break the “க” in it, we get “க் + அ”. Thus, the letter “கி” would be like this: “கி = க + இ = க் + அ + இ”. The presence of “அ” is implicit. While, in some cases it is implicit, in some others they may be explicit. But whatever may be it, “அ” is present in one form or the other. It is the source of all letters / words / sounds, just like Perumal is the source of all objects. Swami Nammazhwar says in his Thiruvaimozhi, “karandhengum parandhuLan” and “karandha silidam thOrum idan thigazh porul thOrum”. He is present in each and every entity. It is like seeing ghee inside milk. It is there but not visible to us at this point of time. But the presence of ghee in milk cannot be negated at all. Thus, the letter / name “அ” and Perumal are similar in the manner that it is from these that all the others have been born out of. So “அ” denotes Perumal only and no one else. kambanAttAzhvAn, in his kadimaNap padalam of bAla kAndam, said “bhU magaL poruLum ena”. This would mean that if we were to refer to something that is so intertwined in its very existence, its meaning automatically gets explained. Likewise, if we just say “a”, its meaning, i.e., “perumAL” is explained automatically. mavvAnavar ellAm: The word “ma” would refer to the entire gamut of all souls. That would be the meaning for the word “ma”. SAsthra say that “ma” kAram always point to an object that has conscience. Even though it says “an” object and thus means singular soul, it is a collective noun in the sense that it includes everything. To give an example to this, if we say “this is one paddy seed”, we do not mean that there was only one paddy seed. We mean the fact that there was only one kind of a paddy seed. So the singularity is for the type count and not for the unit count. Likewise, “ma” would include all souls that has conscience. The souls can be classified into three types. (a) those that gets birth inside a body again and again due to karmA, (b) those that gets liberated from this kArmic cycle of rebirths by perumAL’s causeless cause and (c) those that never get affected from karmA and are always in unison with perumAL. These three are referred to as “baththar”, “mukthar” and “nithyar” respectively. All these three are collectively referred by this one word “ma”. uvvAnavar: The word “uvvAnavar” would refer to the person who is the meaning of the word “u”. “ukAram” describes an AchAryan. SAshtrAs says that the direct meaning of “u”kAram would be periya pirAtti Sri mahAlakshmi. She is someone who acts as a common connection between a soul and perumAL and ensures that they get united. In an exactly similar fashion, it is an AchAryan who unites a soul with perumAL Sriman nArAyaNan. Since the actions of pirAtti as well as AchAryan are both the same, “u” kAram denotes AchAryan too. In addition, an AchAryan has bhakti towards pirAtti and earns her affection. AchAryan ensures that, those who take surrender at the lotus feet of one’s AchAryan, gets her affection as well which would eventually get the love and affection of perumAL. Since, both AchAryan and pirAtti perform a recommendatory role for the eventual action of getting the love of perumAL towards a person, an AchAryan is referred by “u”, the very same word that means “pirAtti”. There is a story to illustrate this. Once upon a time, when emberumAnAr was happy, he explained the aforementioned meaning of “u”kAram to his sishya known as “mudhaliyAndAn”. This was passed on by mudhaliyAndAn to his son namely “kandhAdai AndAn”, who in turn passed it on to “bhattar”. The meanings of “u”kAram as told by svAmi emberumAnAr, was compiled and told in a book called “praNava sangraham”. In this book, it is told that the meaning of “u”kAram is AchAryan. The author of this work namely “pramEya sAram” is svAmi aruLALa perumAL emberumAnAr. Since he talks about this meaning of “u”kAram in this work, it can be inferred that svAmi emberumAnAr told this exact meaning of “u”kAram to svAmi aruLALa perumAL emberumAnAr as well. The latter was a dear sishyas of svAmi emberumAnAr. He served his guru svAmi emberumAnAr for a long time and became the target of his divine compassion. adimai enRu uraiththAr: These souls eternally serve as servants to their eternal master who is being referred as “a” (sriman nArAyaNan). The relationship that exists between a “ma” and “a” is a “MASTER-servant” one. This relationship is being shown to “ma” by an AchAryan who is the mediator. Only when an AchAryan (represented by “u” here) shows the sishya (who is represented by the word “ma” here), the relation, latter gets to know of it in its fullest sense. Thus the phrase “avvAnavarku mavvAnavar ellAm uvvAnavar adimai enRu uraiththAr” goes ahead to show that an AchAryan shows / reveals the “MASTER-servant” relationship between perumAL and the soul. There is story to illustrate the relationship that can be seen in thiuvAimozhi Edu vyAkyANam. Once upon a time there was a trader who occupation was to go place and earn money by trading. His wife was pregnant. One day, he left home, crossed sea and reached another country for business. Before he left, he told his wife that it may take some time for him to be back home and that she should teach “trade” to their yet to be born son. She delivered a boy after some time. The boy grew up into a youth, learned the art of trading. It was time for the son to involve himself in overseas trading. Incidentally, he ended up in the same country where his father landed. He started to do trading there in that country. One day, there erupted a fight between the father and the son who were now sharing the same port of trading. The fight was about some business rules. Seeing the fight, a lot of people assembled to see what is going on with these two people. Among those group of people, there was an old man who knew both (father and son) of them. Seeing the fight, the old man said, “Hey guys!!! Look!!! Why are you fighting between the two of you? You are the father and you are his son”. He united these two by informing the relationship between them. After this, both father and son reconciled. In fact, their happiness knew no bounds once they knew the true relationship. Thus, the AchAryan is the mediator between a person and perumAL. The relationship is not being created by anyone. It is being there forever. In the story, the old man did not create a new relationship, rather he just reminded them of the existing relationship. The one point about this story is that while in the story the father was oblivious of the fact that he is the father, in actuality, perumAL is never oblivious of anything. HE just reincarnated in a human form as AchAryan, so that a person can go unto him easily and surrender. Thus, an AchAryan is someone who serves as a mediator between a person and perumAL. He reveals the “MASTER-servant” relationship between them. An AchAryan reveals more about perumAL to a person. He says that a perumAL is the one and the only one who is a mother, father, relatives and everything else to a person. On the other hand, this same AchAryan tells perumAL that this soul (person) is someone inseparable from HIM and that HE should forgive his sons and take him unto HIS lotus feet. An AchAryan liberates a person by doing this. This is what an AchAryan does to a person and is being celebrated in this pAsuram. ivvARu kEtirupARkku: This refers to the group of people who had listened to these aforementioned concepts of “a”, “u” and “ma” from their AchAryan and stood by it. Thirumanthiram has in itself the name of perumAL as “nArAyaNA”. This name can be split into “nAra” and “ayana”. One’s AchAryan explains to his sishyAs about the relationship between “nAra” and “ayana”. “nAra”, simply put is about the soul and “ayana” is about perumAL sriman nArAyaNan. AchAryan advises that the soul is always subservient to its eternal master sriman nArAyaNan. After listening to this advices, the sishyAs lives a life abiding by it. AL enRu kaNdiruppAr: There are few persons who serve such sishyas described in the previous paragraph. These person treat these sishyas as everything for them. The first level is to be a servant to perumAL Sriman nArAyaNan. Extending this logic would mean that the servant does everything that his master sriman nArAyaNan likes. HIS like is nothing but a person be a servant to HIS devotees forever and do kainkaryam to them. Hence, the last level is for a person to be subservient to the devotees of sriman nArAyaNan. This is what is explained by this particular phrase “AL enru kaNdirupAr” in this pAsuram. In thirumanthiram, three essential qualities of a soul is being explained. They are (a) this soul is servant to no one else apart from Sriman nArAyaNan. (b) There is no refuge for a soul apart from sriman nArAyaNAn and (c) there is no other happiness to a soul apart from sriman nArAyaNAn. In these three salient qualities of a soul there is an impregnated meaning that is implicit. If we were to replace “sriman nArAyaNan” with “devotees of sriman nArAyaNan, we would get three qualities of a soul that bear reference to the deveotees of sriman nArAyaNan. They are (a) this soul is servant to no one else apart from devotees of sriman nArAyaNan. (b) There is no refuge for a soul apart from devotees of sriman nArAyaNanand (c) there is no other happiness to a soul apart from devotees of sriman nArAyaNan. The reason why replacing “sriman nArAyaNan” with “devotees of sriman nArAyaNan is being talked about in the first place is because of the fact that Sriman nArAyaNan loves HIS devotees more than anything else. Hence, it would not be contradictory to anything. It goes ahead and explains the meaning of being a servant to the servants of perumAL that is often called as “charama parva nishtai”. Hence, to know one’s true self is to first realize that he is servant to perumAL. After having realized that, the next step, rather the last step would be the logical extension of it, which would be to realize that he is a servant of servants of perumAL. 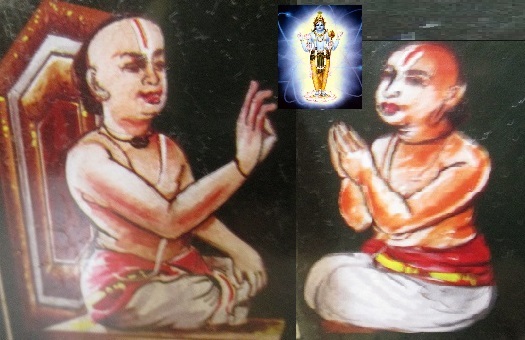 mItchiyillA nAtiruppAr enRu irupan nAn: svAmi aruLALa perumAL emberumAnAr, the author of this work, strongly believes that those who are the servants of servants of perumAL will go to paramapadham, a place of no return. There, they will be with the elite company of nithyasUris who are always there with perumAL. He uses the word “nAn” to stress that he strongly believes in it. The reason is because svAmi aruLALa perumAL emberumAnAr learned the esoteric purports of vEdhAs from his AchAryan namely svAmi emberumAnAr. He was well respected as he lived by the words of his AchAryan svAmi emberumAnAr. svAmi aruLALa perumAL emberumAnAr, after learning the vEdhAs and other shAshtrAs from his AchAryan, concludes with a strong statement that this is the truth. The truth that these people who are servants of servants of perumAL never come back to this materialistic world and suffer. They will reach paramapadham and be with nithyasUris forever. This entry was posted in Other, pramEya sAram on December 20, 2015 by venkatesh erumbi.